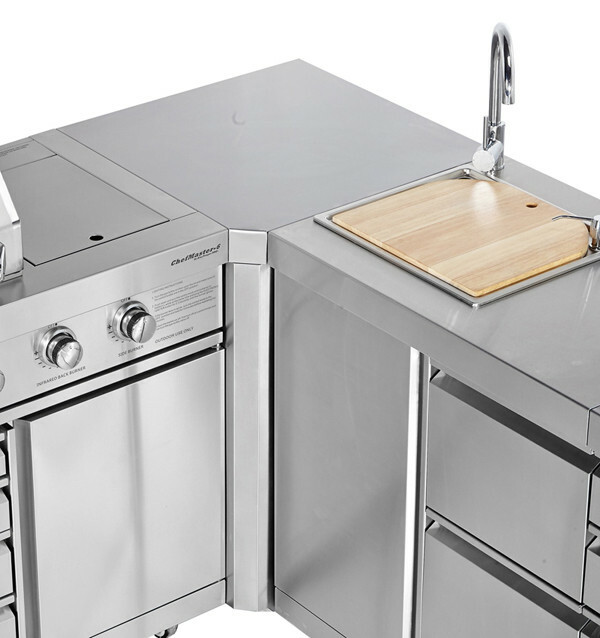 This module is designed for use with the ChefMaster-6 and ChefMaster-8 BBQs and any of the the ChefMaster Galley series outdoor kitchen units. It creates a seemless transition of your modules around two walls allowing installation of the Outdoor Kitchen into smaller spaces. This module is not designed for use with the BlueTongue BT8SS barbecue. If you need to connect the BTK-SR, BTK-SR2 or BTK-SWB to this BBQ you will need the BlueTongue BT-KJ Corner Module which is listed under "Parts & Accessories"